Here is my second circle charity quilt „Round No. 2“. 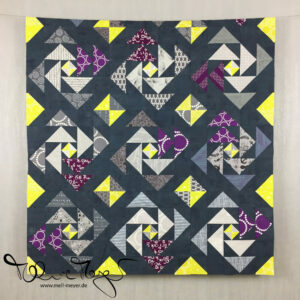 As quilt no. 1 it was started as a class project in 2013. The fabrics of both quilts are „one each“ of the fabrics I had at the time I took the class. The purpose has not changed, it will be gifted to a neonatal hospital station. If you want to read a bit more about it, here is the link to the first circle quilt. I used the same backing and binding fabrics as on the first quilt. And the quilting is the same as well, organic wavy lines. 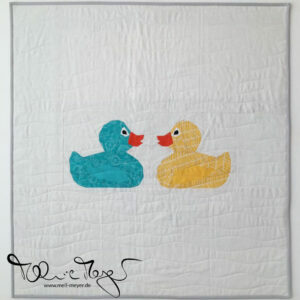 Sew cute Tuesday @ Blossom Heart Quilts and Finish Along 2016 @ She Can Quilt. My original #2016FAL list for Q1 is here. Congratulations to the finish. It is a beautiful quilt and will give a lot of joy. It’s a lovely finish! Thank you for participating in the FAL, on behalf of the 2016 global FAL hosts. You really have quite a few fabric gems in this one. I love the scrappy look and feel of this one. 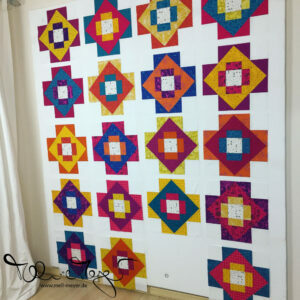 A drunkard’s path quilt in any size really is an accomplishment – congrats! Your stash looks a lot like my stash – not the same but lots of overlaps and similar fabrics! I too donate to the neonatal unit. I donate tiny quilts to decorate the cribs. How do they use bigger ones like yours in your local hospital? I adore the super accurate seams, well done on the finish!